Music has various facets: emotional, physical, social, mental, spiritual and aesthetic. Many people claim that music has therapeutic effects and can be used on a daily basis to promote wellness and relieve stress. Recent studies have shown that therapists can use music to help patients restore, improve and maintain their health and fight depression. Depression is a very common disease of our time. Symptoms of depression can be seen in sleep patterns, disturbed appetite, feelings of guilt and worthlessness and guilt and low self-esteem. Music therapy prevents chronic stress while promoting relaxation and health. We all know that music can affect on our physiological reactions, our emotions, as well as our outlook on life. It's not difficult to understand how music therapy has easily gained in popularity. Music therapy is used nowadays with patients of all ages and is believed to be useful with : communication disorders, physical handicaps, medical problems, psychiatric disorders, interpersonal problems, developmental disabilities, substance abuse, sensory impairments and aging. Music therapy is also used to build self-esteem, improve learning, reduce stress and facilitate different other health-related activities. A degree in music therapy requires proficiency in music history, improvisation, reading music, music theory, voice, piano, guitar. 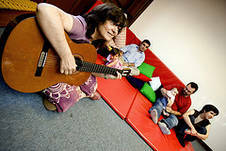 Music therapy is usually used in conjunction with psychotherapy, counseling and various other practices. A typical therapeutic intervention may include listening to music in groups, improvised singing, body movement and painting to music. During the session, the therapist must create a proper environment and atmosphere to make patients actively participate. Make sure you always listen to music you enjoy as music you don't like will create stress instead of alleviating it.